Easy Chocolate Ganache Tart — Welcome to Fitty Foodlicious! Chocolate is one of the most popular desserts to eat on Valentine’s Day, and there’s no better way to show your love than to make your honey-pie Chocolate Ganache Tart. It’s way easier than you think and can be made ahead of time before Valentine’s Day with just a little help from Raley’s. I’ve partnered up with my friends from Raley’s to show you how easy and affordable it is to make the most delicious Valentine’s Day recipe ever. This recipe pairs perfectly with my Easy One Pot Fettuccini Alfredo and will round out the perfect meal for all of the special people in your life. I’ve listed and linked all of the ingredients below from Raley’s website so you can easily save them to your cart and pick them up at your favorite Raley’s store or have them delivered. This Chocolate Ganche is super easy and fun to make. Grab your partner or loved one and have them make it with you! It’s a fun way to spend time together. You will also need a 13-inch tart pan (I suggest using a ceramic one) and a glass with a flat wide bottom to help shape the crust. The Chocolate Ganache Tart will keep in the fridge in an airtight container for up to three days. Have you guys made Chocolate Ganache Tart before? What’s your favorite Valentine’s Day dessert? If you make this recipe, please tag @fittyfoodlicious and @raleys in your posts using the hashtag #fittyfoodlicious I love seeing my recipes in your kitchen. 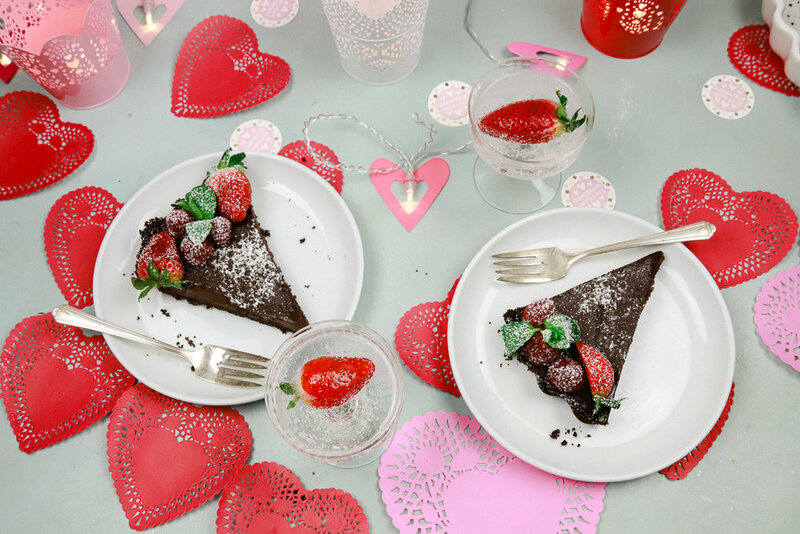 Chocolate is one of the most popular desserts to eat on Valentine’s Day and there's no better way to show your love than to make your honey-pie Chocolate Ganache Tart. It’s way easier than you think and can be made ahead of time before Valentine’s Day with just a little help from Raley's. In a small bowl, combine the graham cracker crumbs and the melted butter until combine. Crumbs should be slightly dry. Place the prepared tart pan on a silicone lined baking sheet and bake at 350-degrees for 10-minutes. After 10-minutes, remove the tart pan from the oven and let cool for at-least 5-minute. Place the semisweet chocolate in a glass bowl and set aside. In a medium saucepan, mix the butter and heavy cream on low heat until combined. Do not let the heavy cream curdle. You’ll know the heavy cream is ready when it starts to boil. Immediately pour the heavy and butter mixture over the chocolate and combine. Use a spatula to combine the chocolate and heavy cream mixture. Add in the espresso and vanilla extract and combine everything again. This step takes time, be patient with it. The chocolate will be nice and smooth when everything is combined. Top the Chocolate Ganache Tart with fresh strawberries, raspberries and fresh sprigs of mint. Sprinkle with confectioners sugar or fresh whipped cream just before serving. The longer the Chocolate Ganache Tart sits in the fridge, the easier it will be to slice.